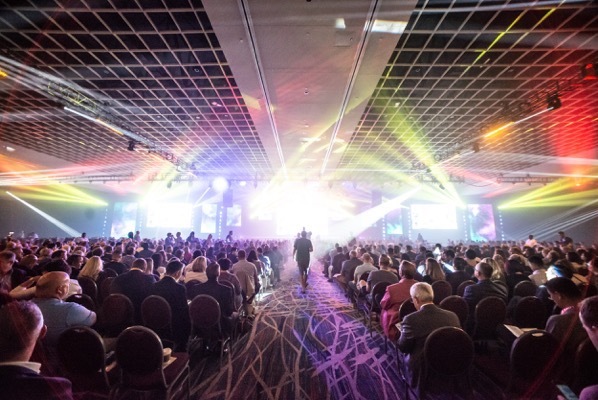 As three days of unparalleled educational opportunities and thrilling entertainment options came to a close, attendees left the Rosen Shingle Creek Resort in Orlando understanding why Dentsply Sirona World remains the premier dental event in the world. “With more than 100 Breakout Sessions, rousing General Sessions, top-tier entertainment and lively social activities, Dentsply Sirona World proved why there is no equal to the Ultimate Dental Meeting,” said Vice President of Marketing Ingo Zimmer. Held Sept. 13-15, attendees filled enlightening education sessions taught by the biggest names in dentistry, got hands- on with the most innovative technologies and products on the trade show floor, experienced once-in-a-lifetime private shows from singer Katy Perry and comedian Jim Gaffigan and so much more! Continuing educational courses were offered in 12 specialized tracks, a record for the event. Attendees had no shortage of incredibly high-quality learning opportunities when they personalized their schedules to meet their needs. The General Sessions kept attendees on the edge of their seats with inspiring speakers, including Dr. Dan Butterman, Dr. Stephen Sterlitz, Heidi Arndt, Jennifer Chevalier and Brian McCarthy. Additionally, Dr. Ross Enfinger performed a live dental procedure. Per usual, Dentsply Sirona World offered its guests the chance to experience celebrity entertainment in a personal setting. Pulitzer Prize-winning author and New York Times best seller Doris Kearns Goodwin captivated the audience with her keynote address, sponsored by Implant Seminars, while Grammy-nominated comedian Jim Gaffigan kept them laughing with his standup and you could really hear the crowd ROAR during global pop superstar Katy Perry’s private concert. Two wellness activities allowed attendees to better both their minds and bodies, as Compassionate Finance sponsored both a medieval fun run and a yoga class. Attendees were in a jovial mood wearing their best medieval-inspired costumes, as they made their way along the Rosen Shingle’s beautiful championship golf course during Friday morning’s fun run. On Saturday, guests looked inward and found their Zen during the Yoga Mix! Modern Twist on Yoga class. The Oktoberfest gathering was the perfect end to an amazing three days in Orlando. Guests put on their lederhosen or dirndls and hit the dance floor to socialize with their peers. From the rousing Bavarian band, to the scrumptious food to the tasty drinks, this party captured the true spirit of the German festival. Everyone is encouraged to start planning now for Dentsply Sirona World 2019! Scheduled October 3-5, the Ultimate Dental Meeting is heading back to Las Vegas to the Mandalay Bay Casino and Resort. Register now at www.dentspysironaworld.com to take advantage of the lowest prices available for Dentsply Sirona World 2019!